On July 11th, the Irish Seanad will be presented with a unique opportunity for Ireland to be at the forefront of ensuring international law is respected and states, including Israel, do not profit from the occupation of other countries. 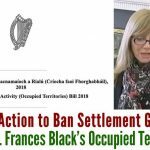 Sen. Frances Black’s Control of Economic Activities (Occupied Territories) Bill 2018 seeks to prohibit the import and sale of goods, services and natural resources originating in illegal settlements in occupied territories. It is imperative that people use this rare opportunity to lobby Senators and local TDs, especially Fianna Fail representatives. The government party Fine Gael has made it clear it will not support the Bill, while Sinn Féin, Labour, the Green Party, and most independents have pledged to support it. However, only with the support of the largest opposition party, Fianna Fail, can it be passed. We firmly believe that Fianna Fail can be moved to support the issue, a move that would be fully in line with their longstanding stated commitment to Palestinian rights – but only if we, the Irish public, let them know this is what we expect of them. We know your time is precious, so let’s not waste it by lobbying politicians who are likely not going to change their minds (but if you have time to do that too, fire away). Now is the time to contact Fianna Fail – FF Senators, your local FF TDs and the leader of FF, Micheál Martin TD – to let them know that you expect them to support this motion. You can be sure that Israel lobby groups are already working hard to ensure this bill is defeated, so it is of the utmost importance that all supporters of Palestinian rights take action right now. Here are the actions you can take, in the order of importance. 1) Call into your local FF TD’s constituency office and let them know you support the bill and you expect Fianna Fail to act in accordance with their commitment to Palestinian rights. A full list of Senators’ and TDs’ phone numbers and email addresses can be found here (Google Docs) . 3) Write a hard-copy letter to your local FF TD, FF Senators and Michael Martin TD’s office. Again, even a few sentences is sufficient. A model letter template can be found here (Google Docs) and below are some key issues to mention – but please if you have time, write your own email or letter; 50 individualised letters, even very short ones, are worth 200 copied and pasted campaign letters. A full list of Senators’ and TDs’ email addresses and phone numbers and can be found here (Google Docs). This is an historic opportunity for Ireland to set a European precedent in respect of international law. The Control of Economic Activities (Occupied Territories) Bill 2018 seeks to prohibit the import and sale of goods, services and natural resources originating in illegal settlements in occupied territories. Such settlements are illegal under both international humanitarian law and domestic Irish law, and result in human rights violations on the ground. Despite this, Ireland provides continued economic support through trade in settlement goods. This Bill seeks to have Irish domestic law fall in line with international law when it comes to the trade in stolen goods and the proceeds of illegal activities. This Bill can help end the international crimes of acquisition of territory by force and the colonisation of occupied lands. Be polite throughout any correspondence, even if someone says they will not vote in favour of it. Talk about how, in light of the US decision to recognise all of Jerusalem, including the occupied and illegally annexed East Jerusalem, as the capital of Israel, this Bill provides a method to help apply brakes to the emboldened rightwing government in Israel which has been massacring unarmed protesters in Palestine. We urge you all to take the time to write or call political representatives to encourage them to vote for this historic Bill. Posted June 28, 2018 in Campaigns, Human Rights, International Law, Irish Government, Jerusalem, National Rights, Political Rights, Press releases, Settlements, Uncategorized.